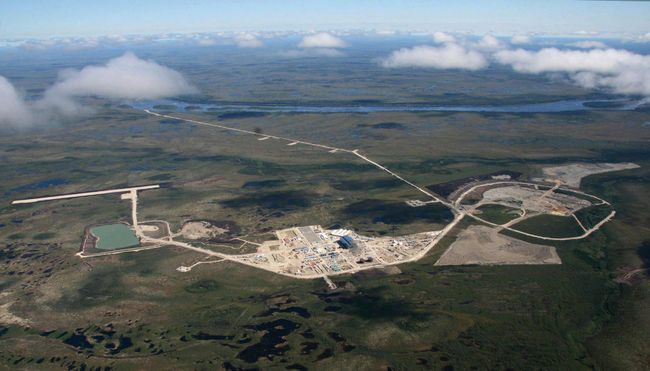 Aerial view of De Beers Canada Victor diamond mine, 90 km from the Attawapiskat reserve in northern Ontario. A nearly three week-long diamond mine ice road blockade was moved to a section crossing the Attawapiskat River while seven of the individuals involved in the protest prepared for a court appearance in Timmins, Ont., Friday. The blockade moved to the ice road section that crosses the river in hopes of subverting an injunction against the protest. APTN National News was told the blockaders believe the reference to the word “road” in the injunction does not include sections that cross water. The injunction applies to anyone “interfering with the immediate and non-obstructed access and use of the South Winter Road,” according to the injunction document. The move “surprised” the OPP Aboriginal liaison officers in the community, APTN National News was told. Attawapiskat Chief Theresa Spence and some of the community’s members involved in the blockade are also expected to appear in a Timmins, Ont., provincial court Friday morning. The court hearing revolves around an injunction against the people who have been blockading the ice road. The ice road leads to De Beers’ Victor mine, which sits about 90 kilometres west of the community. De Beers obtained the injunction against the blockaders last Friday. About seven of the people involved flew to Timmins Thursday evening via charter which was paid for by the band. Spence is expected to tell the court the band wants De Beers to find a negotiated settlement to the dispute. The Attawapiskat band council has refused to officially endorse the protest or pay legal fees for the blockaders. A sheriff served the blockaders last Saturday by planting the injunction, which was stapled to a stick, in the snow at the blockade site. Spence had previously turned away the sheriff after his flight landed at the Attawapiskat airport last Saturday. The sheriff’s plane then flew to the Victor mine airport and in the early morning hours Sunday travelled by ice road to the blockade site. De Beers has been hit by two blockades so far this month. The company has now lost 15 of the 20 days it had expected to use the ice road for fuel deliveries and the shipping of machinery and replacement parts too heavy to fly in, according to a spokesperson for the company. “Should we not be able to complete the program as planned, we are concerned for the health and safety of our employees at the site and the future of our mine,” said De Beers spokesman Tom Ormsby. A previous court hearing was held on the matter Wednesday. “We were pleased to see the court recognize the blockade of the winter road…is the result of individuals with private interests, which is what we have been saying since this illegal blockade began,” said Ormsby. The blockaders, however, say that the protest is about community issues like housing and compensation for lost trap lines. They say the community has benefited little from the Victor mine development, despite Attawapiskat having signed an impact benefit agreement with De Beers. The blockade has been led by Rebecca Iahtail, who says she is dying from cancer. Community members have rallied around Iahtail and some of the people involved in the blockaded who had previously dropped out have now rejoined the protest. Posted on February 22, 2013, in Mining and tagged Attawapiskat, Attawapiskat blockade, De Beers, De Beers Victor diamond mine, native blockades, native protests. Bookmark the permalink. Leave a comment.